I’ve been on a cleaning kick lately. When that happens, I tend to run with it, because it doesn’t happen often. I’ve been cleaning everything that isn’t nailed down, and some things that are. But lately when I clean, I have been going for more natural alternatives. I’ve discovered that simple baking soda is a very common cleaning/scouring cleanser and is safe and easy to use. One thing that I clean frequently: My rings. My engagement ring is far and away the most expensive piece of jewelry I own. 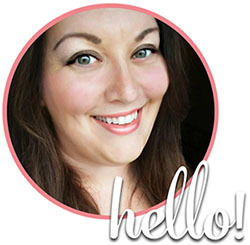 I want to keep it sparkling and I notice that every day, products build up and take the shine away. Soap residue, lotion, shampoo, and anything else my hands get into build up on the surface of my diamond and make it look dull and lifeless. Here’s a great way to bring the sparkle back to your diamond jewelry. Take 1 c HOT water (either as hot as the tap will go, or put it in the microwave till its ALMOST boiling but not quite) and combine with 2 tbsp baking soda in a small bowl. Carefully swirl until the baking soda is mostly dissolved. Drop in your jewels and wait 5-10 minutes. Rinse, dry with a soft cloth and you’re done! For really stuck-on-gunk you can use a soft bristle toothbrush. That’s it. 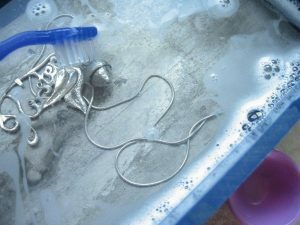 You don’t need expensive jewelry cleaners, or harsh chemicals. My jeweler gave me a cleaning solution with my engagement ring, but its essentially Windex. That means my ring comes out smelling like ammonia, and wherever it drips gets stained BLUE. No thanks! You can also add a few drops of vinegar to the mix if the ring has an excessive amount of buildup. **Please note I have only tested this on my own ring, which is white gold, rhodium plated with a real diamond. I do not know how this will work on other stones. It shouldn’t damage them, but I suggest you check with a jeweler before attempting as baking soda can be abrasive to softer stones and metals. 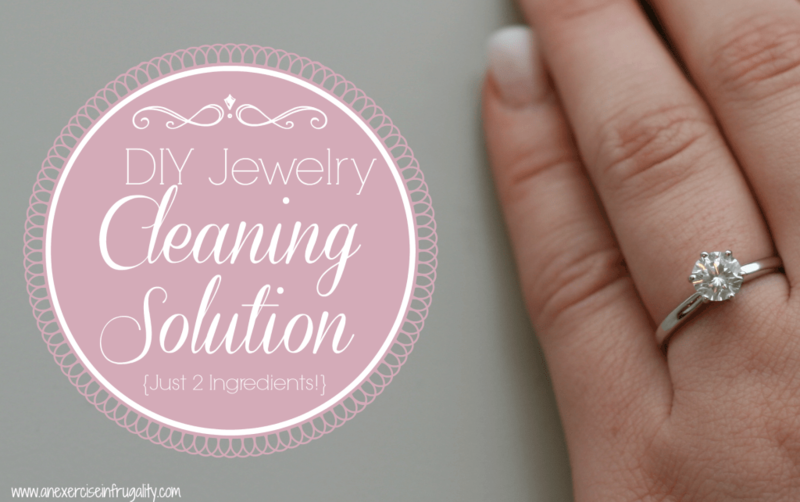 What do you think of this easy DIY Jewelry Cleaner? Do you use it on your own diamonds at home?